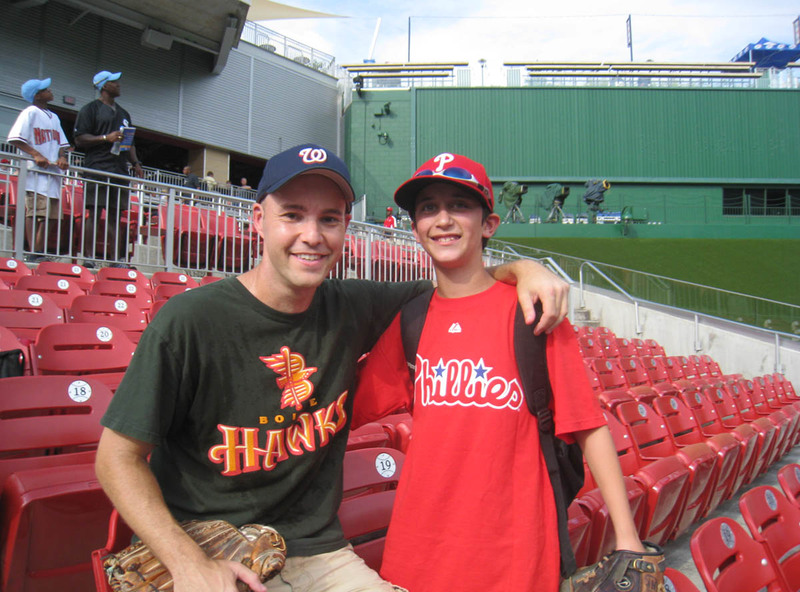 Twenty years ago, I saw a fan make an unbelievable catch that I never forgot. The game was on TV at the Padres’ old stadium, and the batter blasted a deep home run to left. 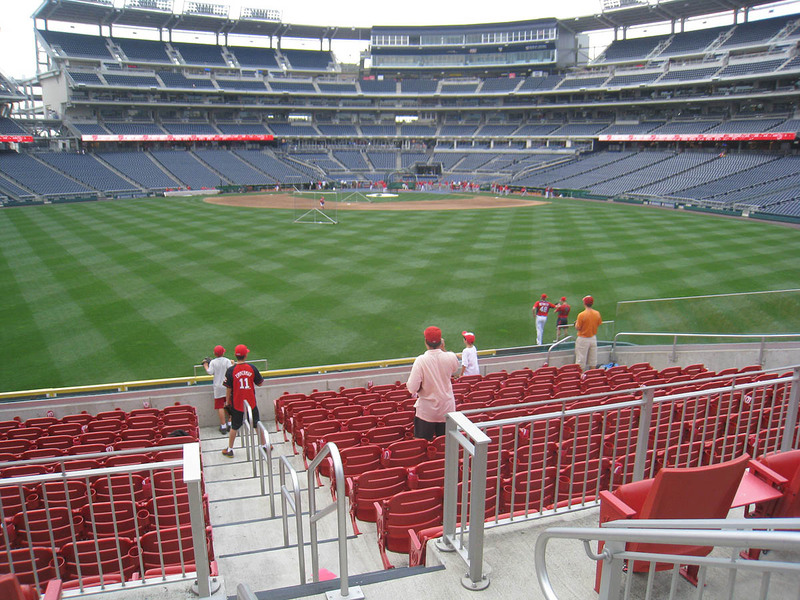 Sitting near the front of the section, the fan turned his back to the field and bolted up a whole bunch of steps. Then, when he reached what appeared to be an arbitrary row, he cut to his left and ran at least 20 feet. When the ball landed, this guy was right there. There weren’t any other fans around. He was alone in the seats. It was basically him versus the ball — and he won. 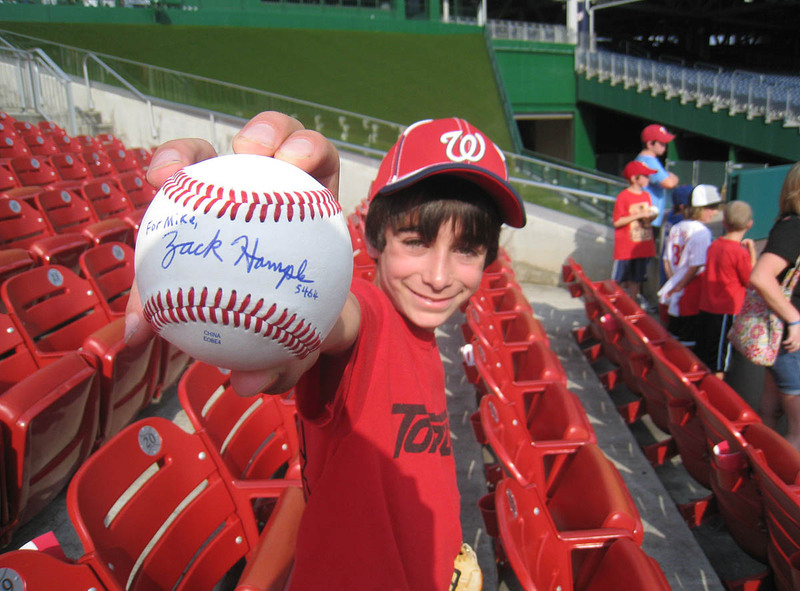 The reason why I’m telling this story is that I made a similar catch the other day at Nationals Park. Granted, mine happened during batting practice, and the “row” I picked was much wider, but it still felt great, and I kind of surprised myself. 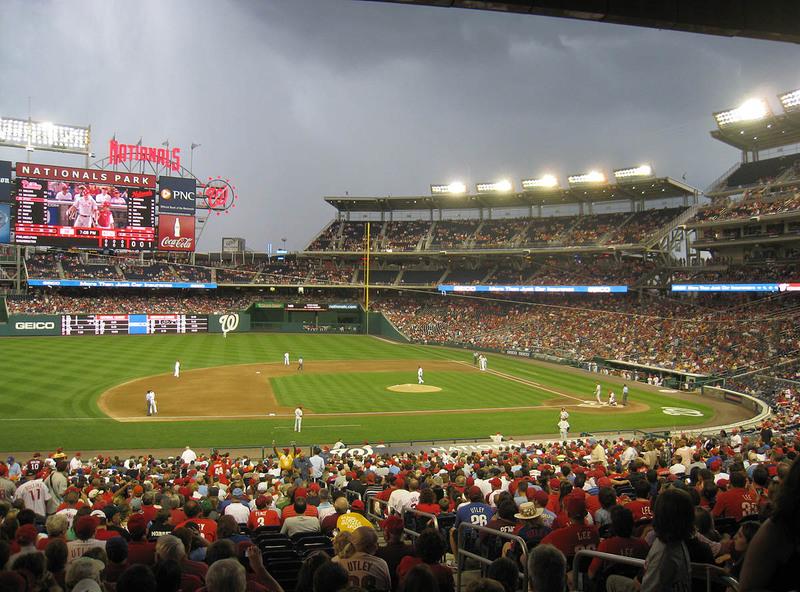 I was standing in the Red Porch seats in left-center field when someone on the Nationals (not sure who) cranked one to my left. At the time, there was another fan standing three rows behind me, but he didn’t realize that the ball was going to travel a LONG way, so when it was hit, he simply started moving through his row. 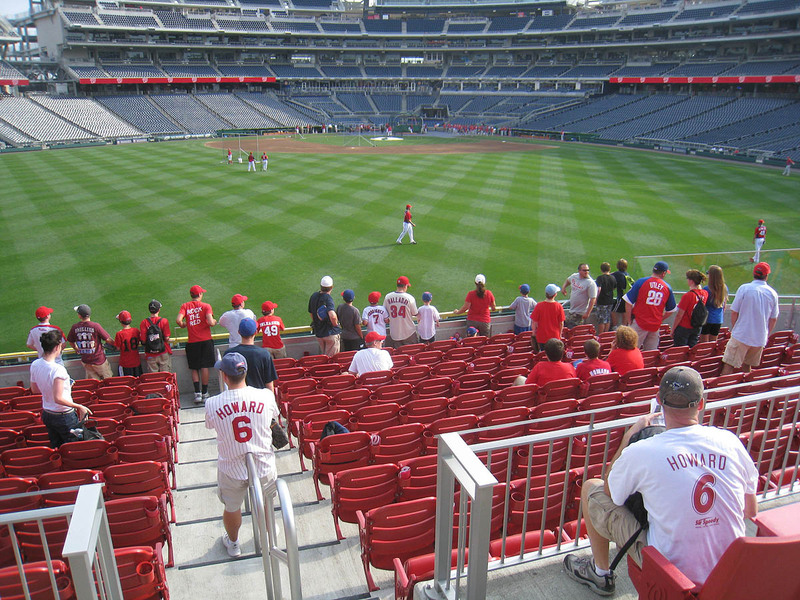 I immediately turned my back to the field and bolted up the stairs, well past his row. When I reached the first platform of tables, I cut to my left, and when I reached the spot where I thought the ball might land, I stopped abruptly and looked up. The home run was a such a towering blast that I still had a second to spare, and when the ball finally descended, I reached out and caught it. Now that I’ve made a catch similar to the one I saw all those years ago on TV, I can tell you that there was lots of luck involved — and here’s why. Whenever a batter connects with the ball, it’s easy to determine which direction it’s heading. Left? Right? Or maybe right at you? With rare exceptions when the ball tails or hooks or gets blown to the side by the wind, you pretty much always know whether you have to move laterally. The biggest challenge is predicting the distance. This is most difficult when the ball is hit right at you, but when it’s hit to one side, you have a better view of the arc. You can see if the ball rockets up toward the sky, or if it merely sails upward like a routine fly ball. The point is that when this ball first shot off the bat, it was heading to my left, so I could tell that it was going to land deep in my section. At that point, since I was already standing on the stairs, there was only one way to go: UP. Then, when I reached the first platform of tables, it was pretty obvious that I had to turn left at that point. Sure, I could’ve proceeded up a few more steps and turned left at the next platform, but that simply would’ve taken too long. Even if I knew that the ball was going to land all the way up there, I wouldn’t have gotten there in time, so it made sense to take the first left and get in line with it. And then? It was just a matter of luck. The ball happened to reach that first platform of tables. It could’ve easily fallen five feet short or sailed ten feet over my head, but instead it came right to me, which probably seemed impressive to the few people who might’ve noticed the route that I took to get there. And it was impressive to me — at first. Ultimately, though, I realized that it was the only place to be. The fan who made the catch in San Diego deserves more credit for several reasons, but if I had to guess, I’d say he picked his row because of the timing of the situation. In other words, he probably didn’t know the exact distance that the ball would travel. Instead (and this is a total assumption on my part) he cut to the left when he did because he sensed that the ball was going to be landing soon. He knew that if he ran up three or five more rows, he’d be too late. No one is THAT good at judging fly balls, but anyone with a certain degree of skill can get THAT lucky. No disrespect intended, but the guy in San Diego probably misjudged a homer earlier that day during BP. I’ll admit that I misjudge them all the time. Watch any major league outfielder on a routine fly; chances are he’ll start by taking a step forward when he should be moving back — or vice versa. Then he’ll drift with the ball right up until the moment that he catches it. …but didn’t go for it because it was heading toward a kid in the front row. I was standing on a chair at the time and easily could’ve reached above the kid and picked it off. Instead, I held back and let him have it — just a little FYI for the haters out there who blindly accuse me of stealing baseballs from children. The usher didn’t respond. He just wiped the seats for the people and then headed back up the stairs toward where I was standing. “So, did you get a tip from them?” I asked. “Yes,” he said with a huge grin. “Thanks.” And he shook my hand. 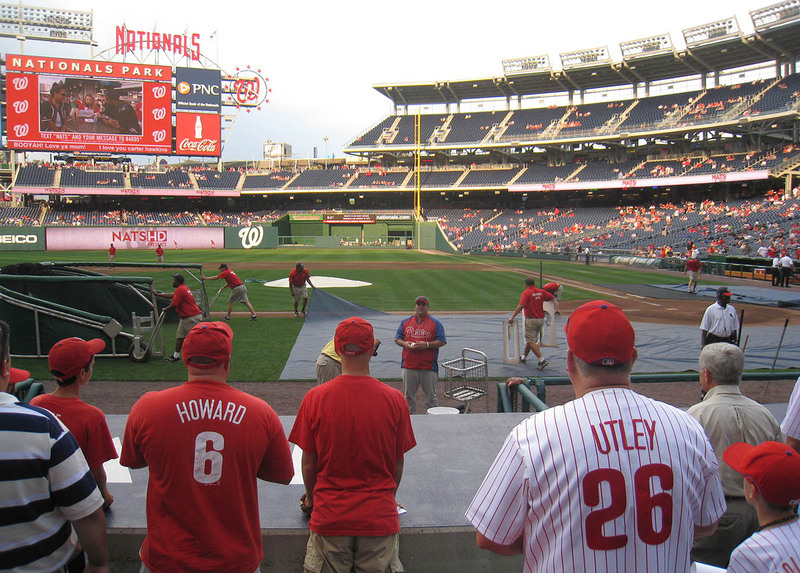 In the photo above, you can see him standing in front of the dugout, looking right at me. (I’m standing to the right of the guy in the “HOWARD” shirt.) I didn’t know who he was. I figured it was bullpen catcher Jesus Tiamo, but later when I combed through the head shots of the Phillies’ coaching staff, I couldn’t find him. Tiamo looks middle-aged. The guy who tossed me the ball looked like he was young enough to be a player, although perhaps a bit too hefty. Can anyone help me identify him? 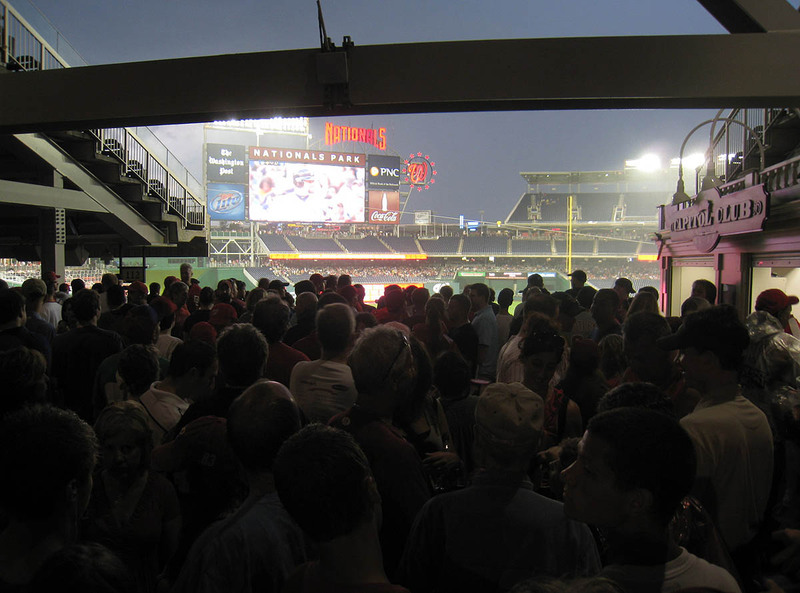 When it started pouring, the people who were sitting down below got absolutely SOAKED because everyone tried to leave at once, and the stairs were completely jammed. Jona and I just sat there and watched. 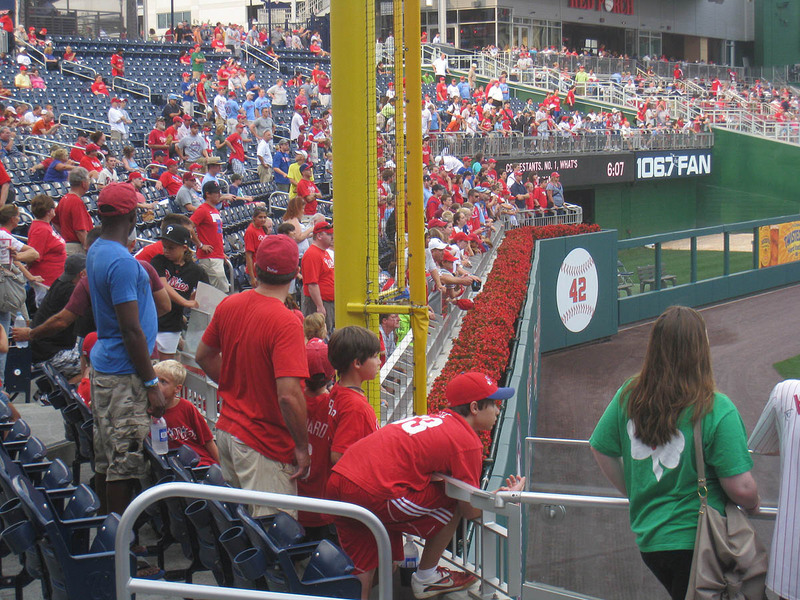 …that it took about 15 minutes to walk from the 3rd base dugout to the left field foul pole. On the way out, I gave one of my baseballs to a little kid with an empty glove, and on the way back to New York, I took Jona to Waffle House for the first time in her life. She enjoyed the overall “experience,” but wasn’t impressed with the food. Of course, she was a vegan for 20 years and still tries to eat raw/organic food whenever possible, so what the hell does SHE know? 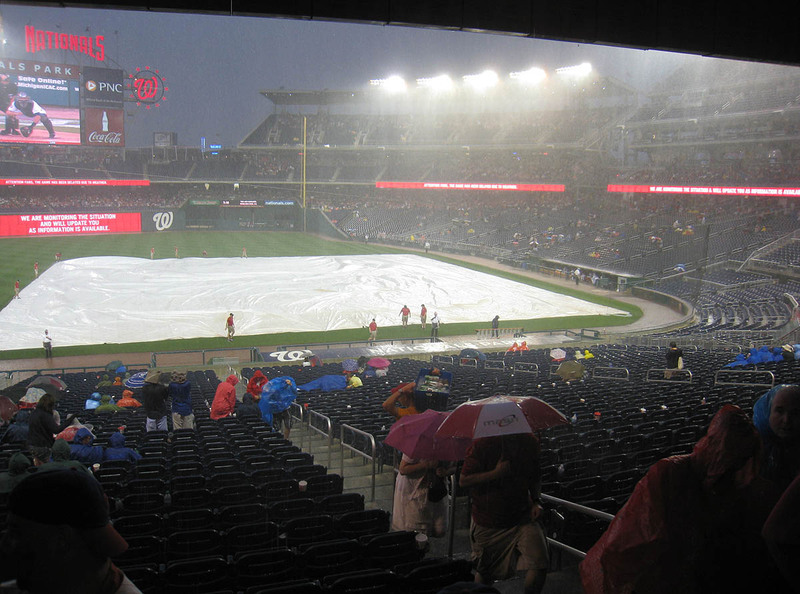 When we got back to New York, I learned that (a) the rain delay had lasted two hours and 22 minutes and that (b) the Nationals won the game, 8-4, on a walk-off grand slam by Ryan Zimmerman in the bottom of the 9th. Guess who surrendered it? That’s right: Ryan Madson. It would’ve been nice to be there for it, but there’s no chance that I would’ve caught the ball. • 805 balls in 94 games this season = 8.56 balls per game. Was that the game that Zimmerman hit the walk off grand slam? Yes! Good call. I actually just added something about it to the entry. And by the way, one of the settings on this blog’s spam filter is that if anyone posts a comment with more than one link, it gets held up for “moderation.” If possible, try to include just one link from now on. Otherwise, if I’m not in front of my computer, your comment won’t show up for a while. Thanks for signing that autograph for me! Maybe I’ll see you again sometime. Ok will do, thanks for letting me know. White shirt on the left? Yup, Cleveland and Pittsburgh starting tomorrow. As for the final week, AT&T is packed every game, so I really don’t want to be there. Now that you’ve mentioned this, I think I heard someone shout the name “Ali” at the time. Is he the guy in this photo? Because that’s who gave me the ball. Thanks so much! Can’t believe Jona had never been to a Waffle House lol. Hope they fixed the grits and sweet tea correctly. Yup, the guy in the photo with Polanco is Ali Modami. You’re welcome! Oh, now that i think about that, it makes compelete sense. And for the record, I have never been to a Waffle House. But then again, I live in California so I have In-n-Out Burger and I think that kinda makes up for it. I went to two games at Kauffman on Wednesday and Thursday. The first tilt was against the Yanks and the second was against the Red Sox. They were offering the early bird tour that allows you in the stadium an hour early to watch BP all week due to the popularity of the two visiting clubs. I guess normally the early bird tour consists of a brief visit to the Royals HOF and then you have to sit in the in the area behind the dugouts to catch BP and only happens on Tuesdays. Well, with the Yanks they offered 3 options. You could go to the HOF and then watch BP, you could go sit behind the visitors (Yanks) dugout or you could sit behind the Royals dugout. By far the most popular option was sitting behind the Yanks dugout. I chose to sit behind the Royals dugout. I sat far away from anyone else and really wasn’t doing much of anything other than watching the warm ups. After the players finished their tossing, a player whistled to me and threw a ball to my big mitt. I ranged over and it bounced out of the glove. I picked it up and pocketed it. Apparently they wanted to see me catch one, because they whistled again and let one fly. This one was airmailed and missed me by several rows. They whistled a 3rd time and tossed one that landed short and didn’t make the seats. That wasn’t acceptable to them so they whistled a 4th time and tossed me a ball that I caught. That made it 3 balls for the early tour. I suppose I could have played possum and just kept botching catches and got more balls, but I am not really ballhawking this year. My main goal was to talk to Yanks reliever Luis Ayala and get him to make good on his deal with me that was made in 2009. I got and delivered to him a big glove and the deal was that he was going to give me a BP jersey. He got released before he ever made good on his end of the deal and I didn’t feel like being out over $100 to a millionaire ballplayer. 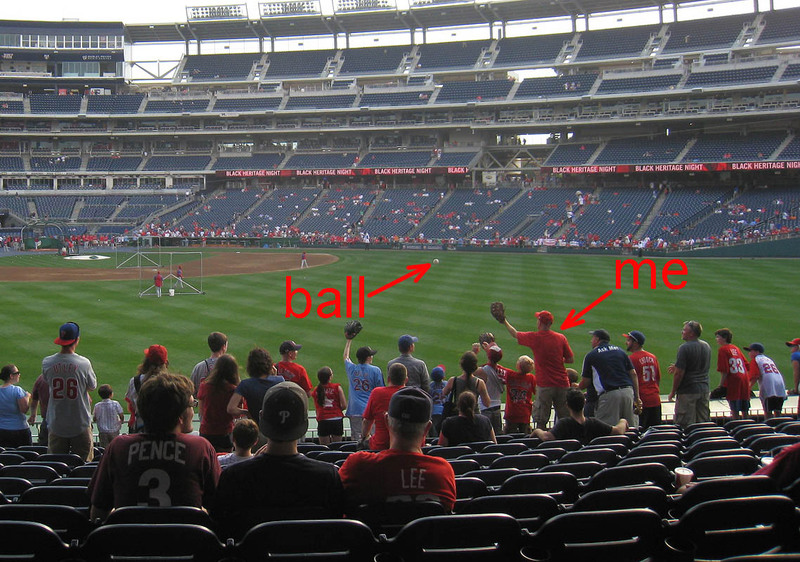 When the Yanks came out to toss, I got a spot on the rail behind Ayala and waited for him to acknowledge me. After a few tosses he did. I tugged on my shirt to signify the jersey I was owed and he pointed to his glove and said something along the lines of “want this?” I said sure and I thought that in lieu of the jersey he owed me he was going to pay me off with a mitt. I was fine with that. After catching with the big mitt for awhile, he returned to where I was standing talking to KC ballhawk Garrett Meyer. He threw my mitt up to me and I started quizzing him about the jersey a bit. Talking with him was like pulling teeth. He told me the jersey he was wearing was his only one. I still had his glove with me, so I told him I should just keep the mitt as payment. That idea didn’t fly and I didn’t push it and so I tossed him his glove back and he went back to shagging balls. He gave me one of the next balls he shagged. I wonder if he thinks that he can just pay me off in BP balls? I was now up to 5 balls on the day and that tied my record from when I was actively ballhawking. 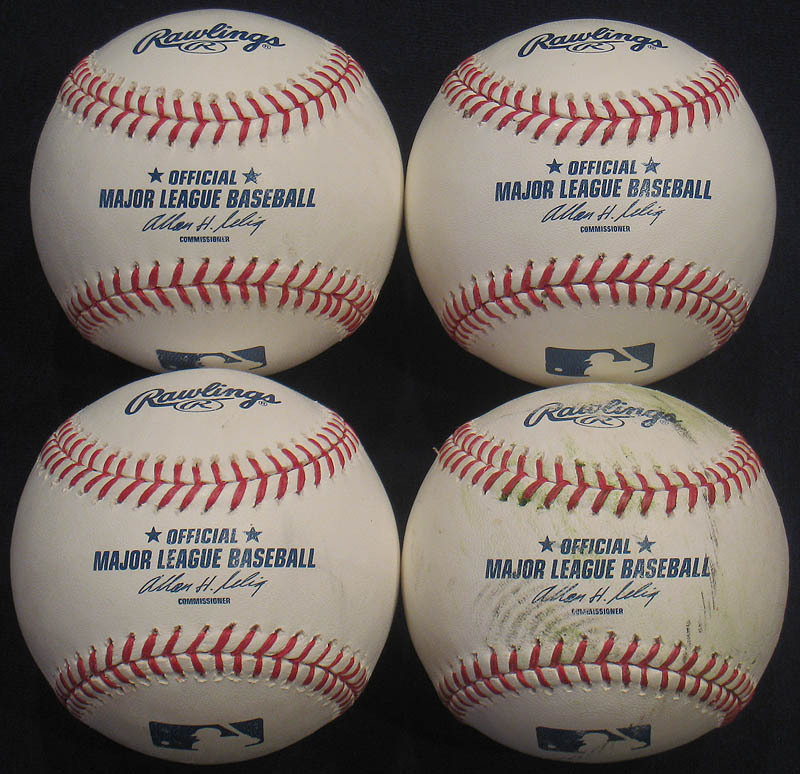 During the game, I sat front row behind the Yanks pen and got a toss up for my 6th ball of the day and a new record. If they offer the early bird tour when you are in KC, I would suggest that it is worth a shot. It is only $10. I will let Garrett speak to his results if he sees fit. I really enjoy this blog and it deserves to be at the top of the list. Kudos! I just saw your comment on a newer entry, so I answered you there. Well, she did have grits, but no iced tea. In-and-Out Burger *is* great. I’ve been there a few times and love it. Fantastic story. Thanks very much for taking the time to post it here.